As WRU Performance Director, Ryan is one of the most powerful men in Welsh Rugby. The former British and Irish Lion captained Wales to 3 Grand Slam wins. Ryan Jones is one of the most powerful men in Welsh Rugby, having been promoted to WRU Performance Director. He has vast experience of success on the field, winning 3 Grand Slams in 2005 and as Captain in 2008 and 2012. He is one of Wales’ greatest ever players. Ryan’s new role develops relevant strategies for players and ensures a close working relationship between national team management and regional and Premiership coaches. The 37 year old won 75 caps for Wales, featuring in three Six Nations Grand Slam-winning teams, He also played in all three Tests for the 2005 British and Irish Lions against New Zealand. Ryan Jones was forced into retirement by injury after sustaining a shoulder injury which required surgery. He enjoyed a impressive career, leading the Ospreys to a record four league titles as well as the Anglo-Welsh Cup. He finished his career as a number 8, blindside flanker and second row for Bristol. He began his senior career with Newport, appeared for Cardiff Met, Bridgend, the now-defunct Celtic Warriors and Ospreys before joining English Championship club Bristol towards the tail-end of the 2013-14 campaign. He has a BSc (Hons) degree from UWIC (now Cardiff Metropolian University) and was made an Honorary Fellow in 2008. Ryan was part of ITV Wales’ punditry team over the 2015 Rugby World Cup and is a regular on screen and radio during key tournaments. Ryan is also a great public speaker and undertakes lively Q&A sessions. 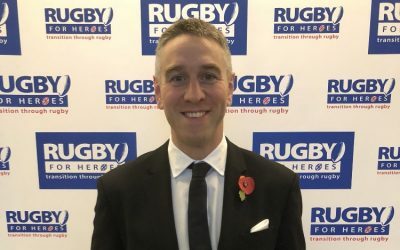 Jones, who has 75 caps, becomes the new Welsh Rugby Union’s Head of Rugby participation and will represent more than 300 clubs across Wales and provide them with a voice at rugby’s top table. Ryan acted as a co-presenter, as well as a panellist. The programme included an interview Ryan had conducted with Wales’ outside-half Dan Biggar.